If you uttered those phrases to any NBA fan this past summer, two things would have happened: first, he/she would have known exactly what you were talking about; and second, probably expressed some "we hardly knew ye" wistfulness at their demise. The foundational identities of this decade's Grizzlies and Clippers teams will forever be inextricably linked. Their windows of contention were concurrent (basically, '11-'12 through '14-'15). They battled each other in two hard-fought, memorable first-round playoff series (in 2012 and 2013). Both franchises overcame histories of ineptitude to produce compelling, competitive teams who "shot their shot" but ultimately fell short of true greatness, and both rosters were kept together well past their respective expiration dates until things came apart at the seams (whether by design or not) last season. Despite their contrasting styles, they seemed to consistently wind up in the same place: always the bridesmaid, never the bride. Memphis made it as far as the Western Finals in '12-'13 before being dismantled by the Spurs, who were perhaps one of the best non-title teams in NBA history. Their next-best chance was in '14-'15, where they racked up 55 wins before losing in competitive fashion to eventual-champion Golden State in the West Semis. They got the band back together after that, gritting 'n' grinding on the treadmill of mediocrity for two more seasons before the bottom fell out last year, when they finished 22-60 amid a string of injuries, in particular to star point guard Mike Conley. They were rewarded for their fall from grace with the draft pick which became talented big man Jaren Jackson, Jr., but most people (your humble columnist included) assumed they were more likely headed for a rebuild than a rebound. While it could be argued Memphis was the victim of hard luck and bad timing, the Lob City Clippers will forever be remembered, first and foremost, for their self-made undoing vs. Houston in the 2015 West Semis. The Clips choked away a 3-2 series lead -- including an 18-point cushion late in Game 6 -- a collapse from which the group would never truly recover, even if they didn't realize it at the time. After two more 50+-win seasons (and dispiriting first-round playoff exits), the team traded Chris Paul (at his behest) to Houston during the summer of 2017, then dealt "Clipper for Life" Blake Griffin to Detroit mid-season. The ax fell on Lob City for good in the summer of 2018 when DeAndre Jordan signed with Dallas (for real this time) in free agency. The mish-mash of talent assembled in the trades cobbled together a respectable 42 wins in '17-'18, but the message was clear: Lob City was dead, and the team would need to chart a new course back to contention. This season, as is their custom, the franchises have taken very different paths back to a familiar, albeit somewhat surprising, destination: the thick of the Western Conference playoff race. The Grizzlies have doubled down on their Grit 'n' Grind identity, and despite the prevailing headwinds of the league's current offensive explosion, it has worked to the tune of a 12-8 start, good for sixth in the constantly shifting sands of the West standings. Amid the "position-less" revolution and the whirring, five-out offenses, the Grizz have a decidedly old-school feel: they are allowing the least points per game in the league (102.0), while ranking dead-last in pace (95.0 possessions per 48 minutes) and 26th in 3-point attempts (27.8 per night, though they are 6th in 3P% at 36.6%). A healthy (for now) Mike Conley has helped them climb to 21st in Offensive Rating (up from 27th last year), but the defensive turnaround has undoubtedly been the catalyst of their early success. Given the results achieved with this formula throughout most of the decade, it's a little unfair to call this season's rebound an outlier (that would probably be last year's 25th-ranked defense, if we're being honest), but enough things have had to go right to question whether this start is sustainable. Two months shy of his 34th birthday, Marc Gasol is having perhaps his best overall season (18.5/9.4/4.0 and shooting 41% from deep on a career-high 4.6 attempts per game) and is back to playing All-NBA caliber defense. Conley -- again, still healthy as of this moment -- has returned to form, and his quiet, winning consistency and general mastery of the point guard position continue to highlight how baffling-yet-also-not-surprising it is he's never made an All-Star team. It's easy to forget after last season's debacle, but a healthy, productive Gasol/Conley pairing ensures a baseline level of on-court competence. In a massively crowded West field, however, the margin for error (and the level of supporting talent) is thinner than ever. The team has dropped three straight games, the first of which was to the Clippers, so there are some warning signs. Last season was undoubtedly rough, but landing Jackson as a result has been a a godsend. His vaunted outside stroke hasn't entirely followed him from Michigan State (34.9% from three on 43 attempts, so small sample size caveats still apply) while his hacking tendency has (5.7 fouls per 36 minutes, a frightening-but-not-uncommon number for a young big), but on the whole, he's been as advertised. His mobility, massive wingspan, and shot-blocking ability (3.0 per 36 minutes) inject a level of athleticism Memphis has long lacked, and he should have no problems picking up the slack as the defensive centerpiece if Gasol decides to opt out of his contract and leave in free agency next summer. Offensively, he's a work in progress, but all the tools of a modern, athletic stretch-5 are there, and it's hard to complain about getting 18.2 points per 36 minutes, an 18.1 PER, and 51/35/73 shooting splits from a guy who just turned 19 in September. Sky's the limit. Free agent signing Kyle "Slo Mo" Anderson has been a quietly fantastic defender (just as he was in San Antonio), and his floor game remains useful, but it doesn't look like it's ever going to happen for him as a scorer. Will they get anything from Chandler Parsons and his papier-mache knees? All available evidence continues to point to an emphatic "no." Beyond that, is there enough offensive firepower on the roster to stay afloat and allow their stellar defense to take them home? Two of the team's five leaders in minutes played are Garrett Temple and Shelvin Mack, and as someone who has watched far too many Wizards' games, that's...umm...not ideal. Dillon Brooks and JaMychal Green top out as competent role players, and guys like Wayne Selden, MarShon Brooks, and Omri Casspi probably shouldn't be getting rotation minutes at this point for a team with any kind of aspirations. The whole has certainly been greater than the sum of its parts to this point, and defense will keep them in a lot of games, but cautious optimism is about the most I can muster for a roster with both depth concerns and an injury-prone star. All in all, things could be (and have been) a lot worse for the Grizz. The return of Grit 'n' Grind has them in position to kick in the door of the West playoffs, and even if they can't, the top-8 protected first-round pick they owe to Boston (say it with me, kids -- thanks Jeff Green!) should convey this summer without causing as much pain down the line as it otherwise could have. Jackson looks like a future star and a tailor-made replacement should franchise icon Gasol leave (or be shown the door) after this season, and perhaps Conley's gargantuan contract isn't quite as crippling as it appeared at first blush. Given the future protections on the Boston pick, there is no incentive to tank, and it's unclear if a team with a healthy Conley in the lineup could do so even if it wanted to, so what we're seeing is pretty close to the best-case scenario. I remain skeptical it will be enough to continue to hang with the big dogs in the West as the season wears on, but the world is filled with enough playa haters, so I don't need to be another one. Going back to Cali, it's starting to look less like small sample size theater, and more like something is actually brewing, for the West-leading (!!) Clippers. 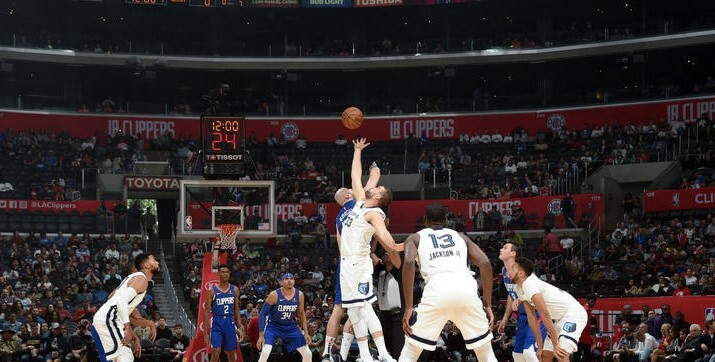 At 15-6, the new-look Clips have fashioned an identity as something of an anti-Memphis: their democratic, star-less system and tremendous depth have vaulted them to the 6th-ranked offense in the league, powered by a fast pace, accurate shooting, and oodles of free throws. Outside of scorers Danilo Gallinari and Lou Williams, the roster is populated with plus-defenders, propelling them to 10th in Defensive Rating. A top-10 rating on both ends of the floor is usually a good indicator of a borderline elite team, so while twenty games may be a touch soon to make any definitive claims, we're probably not dealing with a flash in the pan, either. Unlike Memphis, LA's depth is legitimately impressive, and while their top players are all currently healthy, there does not appear to be any one injury which could truly derail them. The 10th-through-15th players on LA's roster have played a total of 523 combined minutes: Boban Marjanovic, Milos Teodosic, Tyrone Wallace, Luc Mbah a Moute, Sindarius Thornwell, and lottery pick Jerome Robinson. Those are all real NBA players, and they've played roughly the same number of combined minutes as Shelvin Mack by himself! There is truly something to be said for filling every available minute of court time with competent, productive players, and this Clippers' season (along with somewhat similar roster builds in Toronto, Denver, and Milwaukee) is proving it in spades. This may not be exactly the team they meant to construct, but many, many franchises (previous iterations of the Clippers included) have stumbled into far worse. -Houston's 2018 first-round pick: later included as a sweetener for Atlanta to act as the necessary go-between in the sign-and-trade deal for Danilo Gallinari, currently reminding us what an effective scorer he is when ambulatory. -Detroit's 2018 first-round pick: used to select Miles Bridges, who was then flipped to Charlotte for Shai Gilgeous-Alexander who, at age 20, has earned Doc Rivers' trust (no easy feat), is averaging 28.0 mpg, plays with the poise and control of a seasoned veteran, and looks like a star in the making. Nearly as important as the way the on-court pieces from the trade have jelled, however, is the level of flexibility those trades have afforded the Clips' front office going forward. LA is bumping up against the luxury tax this season (including nearly $7.6 million worth of dead money on their cap), but after this year their cap situation is as pristine as a team could ever want. Five of the players listed above remain under contract beyond this season (Gallo, Williams, Harrell, Bradley, and Gilgeous-Alexander); between them, they will make approximately $53.5 million next season, and the only additional monies owed to them beyond next year are a $1.5 million partial guarantee to Lou Williams for '20-'21, and the two team options for SGA, which LA will undoubtedly pick up and should represent gigantic bargains, assuming Shai's current career trajectory holds. Harris is an unrestricted free agent and will be due a hefty raise if LA wants to retain him, but the Clips hold his Bird Rights, so they can offer him a larger contract than other suitors, and it won't impact their ability to sign another max free agent (cue the Kawhi laughing meme) in any way so long as they time the transactions correctly. It's a good place to be. Contrast this with the amount of money currently owed to Blake and CP3. Beyond this season, the two stars are still guaranteed approximately $234 million combined, including about $83.2 million in '21-'22 alone, a season during which they will turn 33 and 37, respectively. [Blake has a player option for that season, just FYI, but the money is guaranteed, assuming he opts to take it.] The upside of not paying a massive premium for a player's decline years -- CP3 is already hurt again and is showing some subtle signs of tailing off, bad news for the Rockets -- and instead potentially putting that cap space towards a star in his prime is enormous. And the formula of "on-court success plus young, rising stars in the fold plus the cachet of playing in LA" could amount to a pretty compelling pitch to free agents. The democratic approach is working terrifically for them at the moment, but history tells us there is a defined ceiling for this type of team. Keeping the infrastructure in place and adding the right top line star to bring it all together would make this squad really interesting in a hurry. While it's probably unrealistic to expect LA to remain on its current perch atop the West standings for the rest of the year, when I watch this team play, nothing about what they do feels fluky or unsustainable. Perhaps they won't continue to lap the entire league in free throw rate or opponent's FG%, but even some regression to the mean in those areas wouldn't suddenly turn them into the Cavs. The underlying statistics don't paint their start as being fueled by an easy schedule or abnormally good luck in close games, and the eye test agrees. Their depth and approach mean one injury/suspension/prolonged slump shouldn't be able to singlehandedly knock them out of their groove, and there's little risk of opposing teams "figuring them out." Doc's strategy of "just keep sending out waves of fresh, consistent, players who fit together" isn't some gimmick a team can gameplan away.